The Belarus Free Theatre has taken on a challenge by putting on Tomorrow I was Always a Lion. 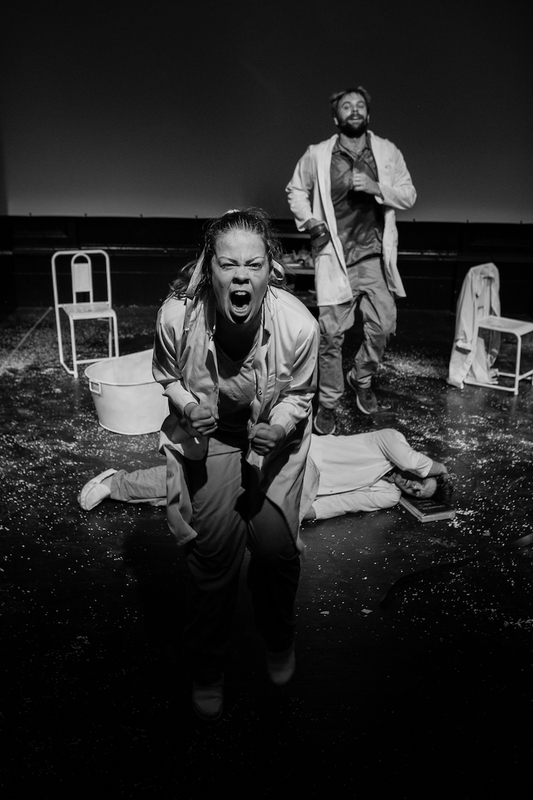 Portraying mental health onstage, especially schizophrenia, is no easy task. Because many people do not know how to address the issue, it can be a little overwhelming to go see a play that is entirely centered on it. Tomorrow I Was Always a Lion is by no means a light performance yet it does not leave the audience feeling depressed and gloomy. The story of Arnhild Lauveng is quite a remarkable one. Not only did this woman live through decades of mental health struggles and confinement in hospitals, she also recovered from schizophrenia and now leads a normal life. Humans are not statistics, as is often mentioned in the play; she lived through hell and wrote her story. If the plot alone does not intrigue spectators to go see the play, the superb acting should. The cast as a whole is very strong. Each depicts an aspect of Arnhild’s psyche or of her life in a way that makes everyone slightly confused but very taken by the story. That being said, Emily Houghton’s performance makes the show. As the play begins, we think it is only her that will talk of the illness because only she portrays Arnhild at first. As she mutters her first words in the dark, everyone is looking for her in the room. She has a strong vocal presence and her entire portrayal is outstanding. The play, it needs to be mentioned, is neither calm nor slow moving. Lights go on and off, scenes change without notice and there is constantly some sort of annoying background noise, be it a whistle, a humming sound or just another actors speaking. This, of course, is the whole point of the show. It is meant to make spectators uncomfortable. Hearing the voices in her head, seeing “the Captain” beat her and observing every actor scream in pain or discontent is not meant to be enjoyable but it is effective in making everyone a part of Arnhild’s challenge. Vladimir Shcherban’s directing is chaoticly brilliant. It is all over the place and adds to the intensity of the performance.